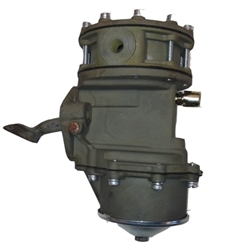 Fuel & Vacuum Pump Assembly M38 Willys Jeep. Rebuilt to the highest standards by AJP. Sold exchange only. Pump, fuel and vacuum, assy. AJP rebuild. These are put back as close to factory new as posible. We require the return of the same type fuel/vac core. The core charge is 100.00 and will be added to your cart when checking out.